So this question came up again on one of the PPG lists - what does it cost per hour to fly a PPG? It’s really a subjective question but lets take a look. When it first came up a few years ago I cranked a spreadsheet and plugged in all the data I had, made lots of assumptions and came up with around 40 bucks an hour. After dusting off the old spreadsheet and updating it based on another 5 years experience, I tweaked the model a bit and based it on a six year time frame. The second assumption is around hours of flying. The average PPG pilot flies somewhere between 40-100 hours per year. I realize there are some air hogs about, but in just about every poll conducted by the USPPA that I have seen, the averge Joe Pilot is somewhere just south of 100 hours per year. The other assumption is around equipment maintenance and useful equipment life. 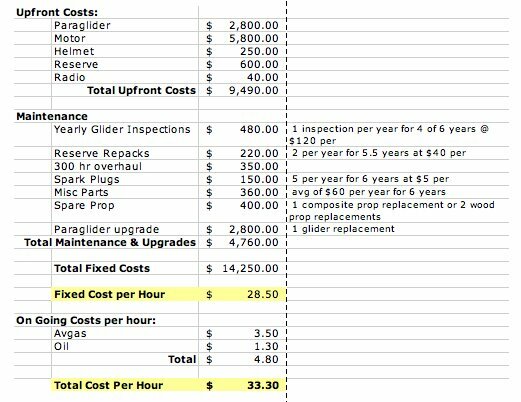 I have factored in regular glider inspections and reserve repacks, and one glider replacement over a 5-6 year period. Most gliders have a 300-400 hour useful life and most pilots get the itch for a new glider every other year or so. Given the 100 hours a year assumption, the useful life of a glider and knowing how much we all love new equipment, I think 1 new glider every 300 hours or 3 years is fair. Most PPG motors have a recommended TBO of 300 hours along with regular maintenance of certain parts. I have assumed that the motor would need an overhaul at 300 hours and would be replaced or upgraded after 6 years for the purpose of this model. Here's the Microsoft Excel version if you want to tweek it.